12 February 2014 - With strong new styling, improved ergonomics, increased power and refined DCT software, Honda's updated NC750D Integra will offer punchy new performance when it scoots into Honda Dealerships in April 2014. 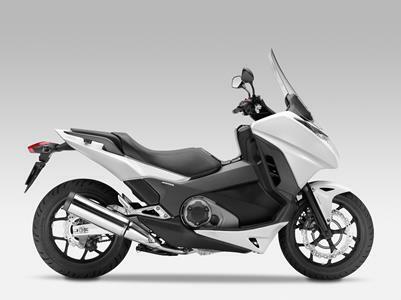 While already offering compact proportions, economical advantages, fashionable good looks and an incredibly low price tag, Honda's popular PCX125 scooter just got more attractive with $300 HondaDollars\* between now and September 30, 2012. The Lead was the highest selling scooter in Australia between January and July 2010. Australia's top selling scooter for 2009 thus far\*, the Honda Lead100, now comes with $250 "Honda Dollars", making it even more economical to scoot around town. January 21, 2009 - The new Honda SH300i introduces a whole new level of style and elegance to the scooter market. 12 November 2008 - The Honda Today50, one of Australia's most popular scooters, has been relieving Australians of fuel guzzling traffic jams for years, and now comes in four funky new colours. Honda has just revolutionised the growing scooter market with the release of the smart and stylish SH150i. The funky and fashionable price tag for the Honda @125 has just been rolled back to a retail price of only $4,990 including GST. Gone are the days of associating scooters with being underpowered, 'pokey' little two-wheelers that are designed strictly for commuting and short distance journeys. The Lead is powered by a simple and straightforward 102cm3 forced air-cooled 2-valve SOHC single-cylinder engine that provides ample power for getting around town in a quick, quiet and economical fashion. Well-padded seat boasts a low, 711mm seat height for added confidence at stops. Underseat storage compartment with 22-litre capacity holds groceries or a full-face helmet. What's stylish and easy to operate, yet economical to own? Honda's Scoopy - now available in two exciting colour schemes. Honda's updated 2014 NC750D Integra (overseas model shown).